The Friday morning commute turned into a challenge for motorists on some Winnipeg streets after a significant amount of rain fell in just a short period of time just after 6 a.m.
Several streets were waterlogged, including the Route 90 underpass, where a stalled vehicle was still sitting at around 8 a.m. (above). The McPhillips, Keewatin and Logan underpasses were also flooded, leaving some drivers to come to a crawl as they made their way through the water to avoid any mechanical damage. 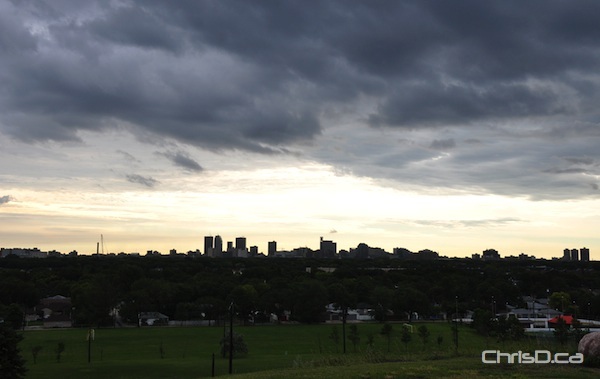 A City of Winnipeg spokesperson says 311 has received about 35 rain-related calls this morning so far. The weather was also being blamed on a traffic light outage on St. Mary’s Road at Marion Street, which forced traffic to become backed up for several kilometres. Police arrived to direct traffic, but not before handing out a number of tickets to motorists who drove through the flashing red lights at the intersection. Manitoba Hydro also reported a number of homes in the city suffered power outages.